How many times can you do a Star Wars Party? Apparently not enough! I have done at least 4 parties. I did the first one over the last 18 years ago for a second cousin. It started with my nephews and now my son. Of course now it is changing to Clone Wars, but we did the original Star Wars for my son's 5th birthday. A galaxy of ideas awaits you as you travel through our party decoration section. If you are having the party in your home, you can begin by setting out a yard sign or banner to welcome the soon to be Jedi's. It also helps mark the house so the Jedi parents know where to drop the kids off (and pick them back up at!). Feel the force! From the moment theâ€¦â€¦enter the house, let them know they are in for some serious battles with the dark side. Red, blue, black and silver balloons lining the entryway are awesome. Tie coordinating colored streaming curly ribbons on them and hang them from the ceiling. Place them on the floor too. You can add Star Wars Balloons to the mix as well. Choose a room to go all out on. Of course you can decorate any or all of the other rooms, but focus first on the main one. I always pick one main room and let helium balloons go in the rest of the house. Enter the deathstar-if you dare! Line the doorway with silver, blue, red or black metallic curtains so the troopers feel they are entering a new world. Tape Star Wars posters on the walls and on the doors. Life size Darth Vader Standup are even available. For a real inner-galactic effect, use a wall mural. Star Wars Table Cover can set the theme for the Star Wars party. Glow in the dark stars look out of sight hung from the ceiling. Stick some on the wall too. You can drape black plastic covering on the walls and/or ceiling so they really stand out. Dangle some Star Wars starships and other accessories from the ceiling as well. For even more fun, let your Jedi create his own Lego star ship before the Star Wars party and hang it as the main attraction. Star Wars Centerpiece makes a great addition to any table. Star War background music really sets the tone. If you want to glow all out, purchase a blacklight. Dim the lights and you will be amazed at the astral effect. A disco strobe light is awesome too. Place light sabers around the room. They can later be used for party favors too. This was a hit at the Star Wars birthday party my son went to. Set up tables for snacks, the cake, gifts and drinks. If your Jedi has any Star Wars toys or collectibles, decorate with them as well. Star Wars bedding, like a comforter and sheets, can be draped across the couch. If your child is a big Star Wars fan, chances are you may have some of these things already, if not, they make fun gifts that can be given before the Star Wars party and used for light years to come. Use your imagination for a Star Wars space station. Decorate large appliance boxes to be space ships. Place a chair or large pillow inside each and cut out windows too. Get your Jedi to help. You might be surprised what he comes up with. The sky is the limit so use your imagination to create a galactic experience your birthday Jedi and his Padawans will not soon forget. First you will want to decide on which of the Star Wars party themes you want to host. Surely your young Jedi has a favorite. Personalize your own invitation. Simply provide the Star Wars party information details and add anything else you want such as if you are having a Jedi Training Academy Star Wars party, you will want to note that the Jedi council has summoned all Padawans to prepare for the trials. If your child is good with artwork or is an artist in bloom, consider having him draw his own front page picture. Once you have filled out the invitations and have them in the envelopes, sprinkle in some Star Wars confetti. Stickers can be stuck on the envelopes too and are available in all the popular Star Wars themes. Donâ€™t forget the Star Wars postage stamps. Remember to mail your invitations out 2-3 weeks in advance. 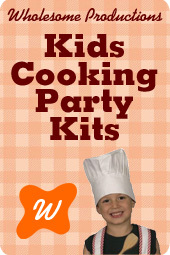 Include any special instructions such as: costume party, sleepover or RSVP. Be sure to provide clear instructions to where the Star Wars party will be and include your phone number in case there are questions. Congratulations on the galactic beginning of an out of sight birthday party! May the force be with you. We we have some truly â€œout of this worldâ€ Star Wars party cake recipes and ideas for you. Just go to Star Wars Cake directions for more details. My son loves this book. Add the finishing touches to your Star Wars party with these great table decorating suggestions. Start with a Star Wars party table cover or even a solid black, blue or red table cover or sheet. Add a Star Wars centerpiece or opt to use a prop instead like a Star Wars Helmet or Yoda mask. The food and snack table is a tasty treat for hungry Jedis so you will want to make it fun and accessible. Try keeping their hands out of the cookie jar with a Star Wars Clone Cookie Jar. Fill with cookies from our recipe section for a sweet treat. You can even use Star Wars theme cookie cutters for truly galactic goodies. You may even have some fun options in your Christmas dishes that you have packed away in the attic like star shaped Orderve trays or metallic plates. Pull out the black Halloween ones too. Cobalt blue dishes give that inner-galactic feel as well and can often be picked up at a thrift store for little to nothing. Try serving Star Wars punches in a punch bowl with Yoda hands sticking out of it or laying next to it. Imagine the Padawanâ€™ faces when you add some blue light ice cubes to the mix! You can assemble a gift table too. Not only is it a great decorative piece, it lets the Padawan guests know you appreciate their presents. Place Star Wars accessories around on all the tables like lightsabers, Star Wars lego projects, Star Wars Miniatures and anything else that is Star Wars themed that your Jedi may have around the house. You can use them later for games and even for Star Wars party favors. With our galaxy of ideas, you and your little Jedi should be ready to roll. Have a blast! This will get you started but we have a whole page of Star Wars food right here as well. The younglings have worked up quite an appetite at the Jedi Training Academy. What shall they be fed? Donâ€™t worry. We have a galaxy of goodies. The time of day the Star Wars party usually determines what type of food and snacks you serve. If it is around lunch or dinner time, consider plenty of Star Wars sandwiches, maybe a galactic pizza and of course, a foot-long lightsaber sub. All of these are found right here. Jello is always a hit. You can even have a Yoda hand coming out of the dish. Sandwiches and finger jello can be served in star shapes with star shaped cookie cutters. Check out our blue glow jello! Padawans must be nourished. Fruit and veggie trays are a healthy snack for the younglings. Make it fun by adding a Star Wars toy on the plate and arranging the fruit and veggie slices around it. An asteroid cheese ball will be a hit served with crackers or chips. Nabisco Star Wars Jedi fruit roll ups are an awesome addition and come in individually wrapped packages so they are fun displayed in a bowl or scattered about the snack table. Super-duper Stormtrooper cookie bars are out of this world. Try the snowtrooper and sandtrooper cookie bars too. For even more fun Star Wars recipes the book Wookiee Cookies: A Star Wars Cookbook is available as well as the The Star Wars Cookbook II -Darth Malt and More Galactic Recipes. Make a memory. Preparing the food can be as fun as eating it when you let your Jedi help. May the force be with you both. Place softened sherbet in punch bowl and add the lemonade and limeade. Gently stir. Add the Mountain Dew just before serving. *For a really galactic effect, add Yoda hands into the punch or set the hands beside the punch bowl if you prefer. Just before serving, place softened ice-cream and kool-aid into punch bowl and gently stir. If needed, add a few drops of blue food coloring. *This is a great punch to add blue or yellow light ice cubes to or freeze lemonade concentrate in star shaped ice cube trays. Mix all the ingredients together in a punch bowl just before serving. You can add a chunk of dry ice for an even darker dramatic effect. WARNING: Be very careful, dry ice can be dangerous. Make sure an adult is with the dry ice at all times if you use it. Donâ€™t use small chunks and wait at least 30 minutes after dry ice is added before serving. Mix together the lemonade or limeade concentrate, lemon juice and grapefruit. Add the amount of water required on the lemonade or limeade can to this mixture. Pour the liquid into glasses, filling them halfway, and add a scoop of lemon sherbet to each. Fill the glasses with club soda and serve immediately. Just before serving, sprinkle the top of each glass with a pinch of lemon or lime-flavored powdered drink mix. Makes for a galactic explosive treat! Notes from Kim: This was such a huge hit at my son's Star Wars party. The kids talked about it for 2 years! The younglings must attend the training academy in order to master the art of Jedi fighting. The begin as a Padawan. Class is in session. The Grand Master Yoda used the Ataru form of lightsaber combat. It is one of the seven forms of lightsaber training used at the academy. Each Jedi must master this form in order to proceed. Make a lightsaber before the Star Wars party by cutting a swimming noodle in half. Wrap the handle with electrical tape (fun colors like blue yellow and fluorescence are available). And yes the colors did matter to the children! Inflate several Star Wars party balloons and have the children take turns trying to keep the balloons from hitting the ground by swatting them with the lightsaber. Each Jedi trainee must pass through the gates of the slave camp to save the civilians. Then they must make it through the obstacles and reach the other side in order to escape. Along the way, they must rescue one civilian. Create an obstacle course using chairs to go under or around, pillows to climb over, crates and baskets to go around, open boxes to crawl through, and anything else you can find that is safe and fun. If the Star Wars party is outside, lawn furniture, a water hose, buckets and dirt piles are great. Play tunnels are excellent to use too. Place a balloon somewhere in the maze to be the civilian who must be rescued. You may need to tie a small object to the balloon in order to weight it down. Have the children take turns going through the obstacles. They must get the balloon (the civilian) and make it to the end of the course without popping it. The younglings have successfully completed their quest to being a Jedi. Line the children up and congratulate them, one by one, with a lightsaber or Star Wars party favor. I recommend a light saber! Ice breaker games are a great way for children at the Star Wars party to get to know one another. Have the children form a circle. Each will then think of a Star Wars nick-name that begins with the same letter as their name, like â€œCommander Colbyâ€ or â€œPrincess Maddyâ€ or â€œPadawon Patrickâ€. Then the group goes around in the circle taking turns introducing themselves (nick-name then name) and repeating each nick-name and name that has been said along the way. If one messes up, the while group starts over. The younglings are ordered to report to Jedi Training. Todayâ€™s lesson is about building trust and following directions. Build an obstacle course out of boxes, pillows, baskets, blankets and anything else you can round up that is safe. Mark the end of the obstacle course with a piece of electrical or masking tape. That is the finish line. It is fun to watch the children work together for a common goal, to reach the finish line. Divide the group into two teams. Give each team index cards with one Star Wars word written on each card. You can glue a picture of the card as well if you would like. That is especially helpful for younger children. Ideas for words include: â€œCP30â€, â€œthe Empireâ€, and â€œDarth Vaderâ€. Each team takes turns acting out the word on the card, without talking. Everyone in the group must participate in some way. The other team gets three guesses. Whether they guess it right or not it is then the next teamâ€™s turn to act. If they did not guess it, the answer is announced. 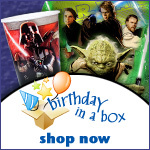 This game is listed in our All-around Games section but put a Star Wars twist on it by asking questions such as: â€œHave you ever seen a Star Wars movie at the movie theater?â€, â€œHave you ever been to the Jedi Training Academy at Disney World?â€ or â€œHave you ever been to another Star Wars birthday party?â€. In order for a padawan to become a Jedi, he (or she) must pass a series of tests. The lightsaber drill is one of the tests. You will need to find a ring that fits loosely onto a lightsaber and every child will need a lightsaber. Inflatable ones are a good and inexpensive option. Have the children form a line and give each one a lightsaber. Have the child at the end of the line hold out his lightsaber. Put a ring on it and have him pass it off from his or her lightsaber to the lightsaber of the child next to him. Keep the ring going down the line from one lightsaber to the next. This game is played like â€œDuck, Duck, Gooseâ€, Star Wars style. Instead of â€œDuck, Duck, Gooseâ€ it will be â€œJedi, Jedi, Sithâ€. Darth is trying to attack the Republic and the Jedis must keep him away. DARTH IS FULL OF HOT AIR! Purchase a Darth Vader balloon and blow it up before the Star Wars party. Give each child an inflated lightsaber. Have the children stand in a line, an arms length from each other. Toss the balloon in the air and have them keep it from touching the ground but only by using their lightsabers. The catch is, they cannot move from where they are standing. Play Star Wars music, if you would like, and have the game last until the end of the song. Darth is at it againâ€¦trying to oppress the galaxy and destroy the Galactic Empire. Put him in his place, the trash can! Line up several trashcans of different sizes. Blue ones are great but any will do. Fill a black sock with beans or unpopped popcorn and tie in a knot to make a Darth Vader bean bag. Have the children line up and take turns tossing Darth into the trash can. Each child gets three tries and gets one point every time they successfully get Darth in the trash. Continue until every child has had a turn. Add up the points and see who has the most then you can have a face off with the winners. Donâ€™t forget though that every child is always a winner. Hundreds of Jediâ€™s in the Jedi Temple will be killed by clones if R2-D2 doesnâ€™t get to them in time. Divide the children group into pairs. Have each player stand next to his or her partner while you tie the partnersâ€™ inside legs together so each couple has three legs instead of four. Mark the starting and finishing lines with black electrical or masking tape. On the count of â€œthreeâ€ each pair races to the Jedi Temple (the finish line) to rescue the Jedis. This game is played like â€œHot Potatoâ€ except instead of a potato, a â€œDarth Vaderâ€ is tossed around. You can use a Darth Vader balloon or a black stuffed sock. Play Star Wars music or set an egg timer and have the children sit in a circle and toss â€œDarthâ€ around. The child that is holding Darth or was the last to touch him when the music or timer goes off is â€œoutâ€. Play until only one child is left. He or she is then the winner but of course, everyone is a winner. Lay out bowls of star stickers, planet and moon shapes, markers, crayons, glitter, glitter pens and Star Wars stickers. You can even include glow in the dark stars. Also set out several bottles of glue. Give each child a piece of construction paper, blue or white, and let them create a Star Wars scene. Shortly before the Star Wars party, make a batch of salt dough by combining 1 cup of salt, Â½ cup of cornstarch and Â¾ cups cold water. Stir all the ingredients together over low heat, stirring constantly for 2-3 minutes or until thick. Turn out onto waxed paper or aluminum foil and let cool. When cool, knead until smooth. If the dough dries out before using, add some water. Let the children shape into stars using star cookie cutters. Stick a paperclip through each for hanging. When they are dry, let them paint them using tempura paint and paint pens. Glitter paint pens and glow in the dark paint pens are great too. Pass out stings for the children to hang their stars on when they are finished. This makes a nice keepsake to take home. You will need one small glass jar with alid for every child. Leftover baby food jars work great. You will also need (for each child): Star Wars miniature figurines, white or silver glitter (chunky works great), plastic bottle cap, non-soluble glue, and distilled water. Have each child glue a figurine onto the bottle cap which will serve as a stand. Glue the bottle cap to the inside center of the jar lid. Let dry. Fill the jar almost to the top with distilled water and add glitter. Place glue along the rim of the jar and inside too and screw the lid on tight. Let dry. If the project is not fully dry by the time the children leave, have them keep the jars right side up until completely dry. When dry, they can shake them up and display them upside down so the figurine is right side up. Purchase a face painting set and let the children decorate each others face to look like their favorite Star Wars character. If you prefer, you or another adult can do the painting. Mix together flour and cold water in a bowl. Add this mixture to the boiling water and allow it to return to a boil. Remove from heat and stir in the sugar. As the mixture cools it will thicken as it does. Cover a work area with lots of newspaper. Give each child a long inflated balloon to be their mold. Let the children tear narrow strips of newspaper and dip the strips into the paste, coating completely. Have them drape the strips around their balloon, overlapping several layers. Let dry and paint. The children can do another activity or game while they are drying and you can even turn on a fan to hurry the process. Then the lightsabers are ready to be painted (tempura paint works great). When the projectâ€™s finished, the children can play with them and even take them home. The padawans will remember the fun they had at your Star Wars party for lightyears to come when you send them home with fun Star Wars party favors. The gift bags can also be passed out during or before the party so the younglings can enjoy the items throughout the party time. This is a great idea if you are giving lightsabers or other items that you plan to use for games as well. The Star Wars Hi-Bounce Ball would work great for a game with asteroids. Pre-filled party favor sets save time and often money as well. There are many sets to choose from in all the popular Star Wars themes including 3-D.
You can also assemble your own favor bags. First you will need to decide upon a Star Wars Favor boxes or container to put the treats in as that will determine how many and what sizes items you will want to include. Star Wars theme loot bags are economical and fun. There are also fun shaped Star Wars favor box containers. Making your own bag is an option. Decorate a black or blue sack with Star Wars: The Clone Wars Sticker Sheets. You can also stick on some glow in the dark stars for a galactic effect. Make your own container with a Star Wars helmet. Simply turn it upside down and add the goodies. Now that you have decided upon a container, you need to fill it. There are tons of fun Star Wars themed toys and treats like yo-yos, bouncing balls, launchers, and wristbands. Every padawon needs a lightsaber so donâ€™t forget to include one in each bag or box. Star Wars Pez candies and Nabisco Star Wars snacks are fabulous fillers. With all our great products and ideas, you will surely have as much of a blast filling the favor containers as the younglings will have receiving them. Of course the birthday boy (or girl) must dress the part of their favorite Star Wars character. From a Stormtrooper, to Commander Cody, Darth Vader, Yoda or even Princess Leia, weâ€™ve got ya covered with awesome asteroid attire you wont believe. If you are working on a tight budget, consider one of these more economical costumes. Star Wars party costume accessories are also available in all the popular Star Wars party themes and can be used in addition to or in place of a costume. Helmets, Star Wars: The Clone Wars Masks, capes, a gauntlet, breathing devices, lightsabers, even a hair braid are fun for the jedi's to dress up in and can even be used for Star Wars party games. Younger siblings canâ€™t be left out. Infant, toddler and child costumes come in every Star Wars character from Yoda to Darth and everything in between. These great costumes can be used again for Halloween, skits and plays, just for fun dress up and can even be donated so less fortunate children can use them.